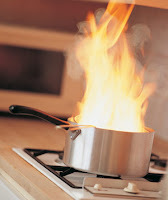 You can put out a small grease or electrical fire with by engulfing the flames with LOTS and LOTS of baking soda. Please note that this is Plan B. Plan A, if you're lucky enough that it's in a pan, is to cover the pot or pan with a fitted lid. Plan C is to use a little Class B fire extinguisher. In that case, be prepared to do lots of cleaning up, but, hey, at least you'll have a kitchen to clean! Plan D is to call 911 to reach the fire department and to pray. Olivia Lane is a Blogger, Green Living Educator, and Health Coach trained at The Institute for Integrative Nutrition. She's also author of Baking Soda & Bliss: The Healthy & Happy Guide to Green Cleaning. Ban eating on the subways? You betcha!